The general objective of this work was to evaluate the effects of different viticultural techniques of vegetation management on the characteristics of grapes and, more specifically and in relation to global warming, their effectiveness in delaying the ripening of grapes and improving the relationship between anthocyanins and sugars. The three main techniques of vegetation management studied were: severe trimming of branches after fruit set, minimal pruning and late pruning. 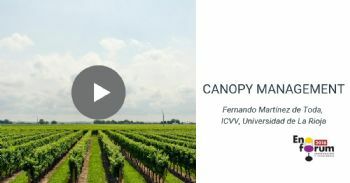 In this video seminar, Fernando Martinez de Toda shows the results obtained on maturation delay, production, berry size and composition. VIDEO SEMINAR ENOFORUM 2018: the objective of this research was to verify if the treatment of the lees by PEAV accelerated the release of mannoproteins during the aging on lees of a Chardonnay wine. Alberto Acedo, of Biomemakers, introduces the researches and analysis on soil microbiome designed for the identification of bacterial and fungal species present in the vineyard.